Gok Wan has reinvigorated our enjoyment of Chinese food. This is not the black-bean sauce we have been used to getting in restaurants and manages to be both light and have great depth with very distinctive Chinese flavours and aromas. Don’t be tempted to omit the pickled chilli as it really makes the dish. Warning: this is nothing like the gloopy stuff you get from the Chinese take-away. Just so you know. Firs make the pickled chilli by putting the strips of chilli into a bowl and cover with rice vinegar. Sprinkle with the caster sugar and leave to soak. Blanch the broccoli in salted water for 2 minutes, then drain and season with a drizzle of sesame oil and some salt. Heat a wok over a high heat and add a good splash of oil. Add the ginger, garlic and scallion and stir-fry for about 10 seconds, just to soften the garlic. Add the black beans and cook for 20 seconds more. Add the steak and cook for 2-3 minutes, or until sealed on all sides. 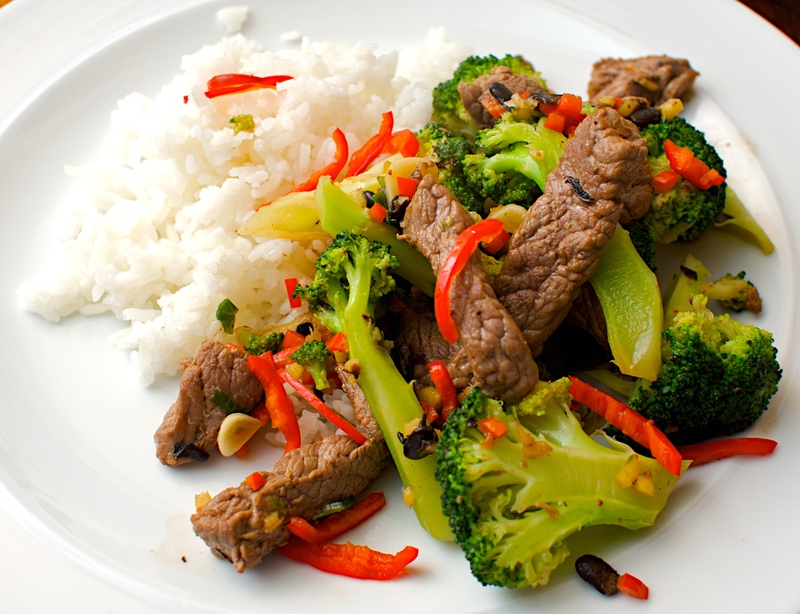 Add the chilli, blanched broccoli and some salt and white pepper, along with the Shaoxing rice wine, 1 tsp of soy sauce and 1 tbsp water. Toss together, then taste and adjust the seasoning if necessary. Drain the pickled chilli and serve with the beef and some rice.